More than mere vitamins, http://www.nuvet.com/81337 goes beyond industry standards by using only 100% all natural, human grade ingredients that are microscopically tested for purity and potency. We then utilize a FDA registered laboratory for formulation and specially compound using state-of-the-art manufacturing techniques. Because most pets lack proper nutrients such as vitamins, minerals, and antioxidants in their diet, even when they are getting the top of the line food, NuVet® scientists understood the necessity of filling this dangerous gap. Commercial pet foods can contain harmful by-products and useless fillers that can be toxic to pets, causing allergies and serious diseases. This typical diet creates a scenario whereby their food may actually be creating unstable oxygen molecules known as free radicals. These free radicals have been shown to be a cause for a wide range of health problems including heart disease, arthritis, cataracts, premature aging and many different forms of cancer. NuVet Labs® has been on the forefront of pet health since 1997. NuVet® formulations have been studied by numerous Universities who have discovered that our ingredients and exceptional compounding properties are designed to fight illnesses at their root source and strengthen immune systems to keep pets strong and healthy. Take a look at our products to see why. At NuVet Labs® we know that a major cause for the ill health of our beloved pets is the lack of proper nutrition with their diets. This is the main reason we developed NuVet Plus®. NuVet Plus® is the culmination of 8 years of research and development, formulated with the goal of creating a nutrient formula that would go beyond mere vitamin replenishment. The supplement is instead a full-spectrum nutritional supplement that focuses on the root cause of illness and disease while simultaneously boosting your pets immune system and overall health. Todays pet foods, even premium brands, can contain toxins, and bad bacteria. Almost all use meat by-products; that is an industry term for anything other than meat. Many of the other ingredients are fillers like corn, wheat and barley. Which are prime sources for allergies, skin problems and other more serious ailments. The regulation of these ingredients tend to be lax, which means they could end up being tainted with disease causing pathogens. Our team of pet industry scientists, vets and medical specialists createdNuVet Plus® to be a high quality product that incorporates a precise formula of vitamins, minerals, enzymes, herbs and antioxidants that performs synergistically to bring together all the vital ingredients required to improve your pets health and keep them healthy. NuVet Plus® is made using only Natural, Human Grade ingredients that are formulated in a FDA registered Pharmaceutical Laboratory. We use a special paddle dried, whole chicken liver that provides vitamin potency as well as a taste your pet will love. NuVet® ingredients are compounded to maintain their integrity and bio-digestibility for complete cellular infusion. Check out our full Ingredient list and descriptions to understand how these crucial elements can help your pet overcome illnesses, allergies and diseases and help them maintain a quality life full of good health, vigor and vitality. Blue Green Algae, Brewers Yeast, Cats Claw, Evening Primrose Oil, Shark Cartilage, Oyster Shell, Alpha Amylase, Beta Carotene, Pine Bark, Papain, L Methionine, Alfalfa, Chicken Liver, Vitamin B1 (Thiamin), Vitamin B2 (Riboflavin), Vitamin B3 (Niacin), Vitamin B5 (Pantothenic Acid), Vitamin B6 (Pyridoxine), Vitamin B12, Vitamin D, Vitamin K, Manganese, Magnesium, Iron, Copper, Amino Acids (Tryptophan, Threonine, Isoleucine, Leucine, Lysine, Methionine, Cystine, Phenylalanine, Tyrosine, Valine, Arginine, Histidine, Alanine, Aspartic Acid, Glutamic Acid, Glycine). Puppy & Kitten Shampoo  Specially formulated to be hypo-allergenic and PH balanced for the delicate skin of puppies and kittens. NuVets® Puppy and Kitten Shampoo is environmentally safe and created to moisturize your young pets sensitive skin and give their coat sheen and luster. Our shampoo contains a coconut base with aloe vera, vitamins A, D, E and a proprietary blend of botanical extracts; no alcohol or animal by-products are ever used. 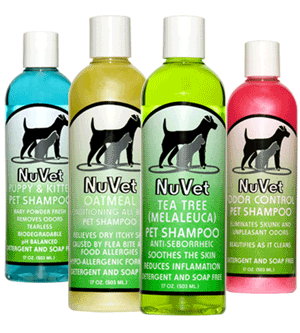 NuVet® Shampoo is tearless and contains no detergent or soaps that can irritate the skin or remove the essential natural oils from skin which your pet needs. Conditioning Oatmeal Shampoo  Created for dogs and cats with dry skin caused by flea bites, food allergies or household chemicals, this hypo-allergenic shampoo relieves pets from the suffering of irritated and inflamed skin. A coconut shampoo base includes vitamins A, D, E, wheat germ glycerides, hydrolyzed oat proteins and a special blend of cherry and botanical extracts and almond oil. This product is detergent and soap free and contains no alcohol or animal by-products. Hot Spot Tea Tree Shampoo  Give your pet quick relief from hot spots, itching, scratching and dry flaky skin caused by flea bites, food allergies and environmental pathogens like grass fungus. Our coconut based shampoo blends tea tree oil, vitamins A,D,E, coconut oil and specifically formulated botanical extracts. Our shampoos contain no alcohol or animal by-products and are completely detergent and soap free so no natural oils are removed from your pets skin. Odor Control Pet Shampoo  Unpleasant odors are a thing of the past; even eliminates persistent odors like skunk. NuVet® Odor Control Pet Shampoo is formulated with a proprietary mixture of odor removers and odor counteractants. This coconut based shampoo is a unique blend of almond oil, vitamins A, E, C, cherry and floral extracts and infused with coat conditioners and skin moisturizers. Our shampoos are soap and detergent free so they wont extract vital natural oils from your pets skin and we never use alcohol or animal by-products.